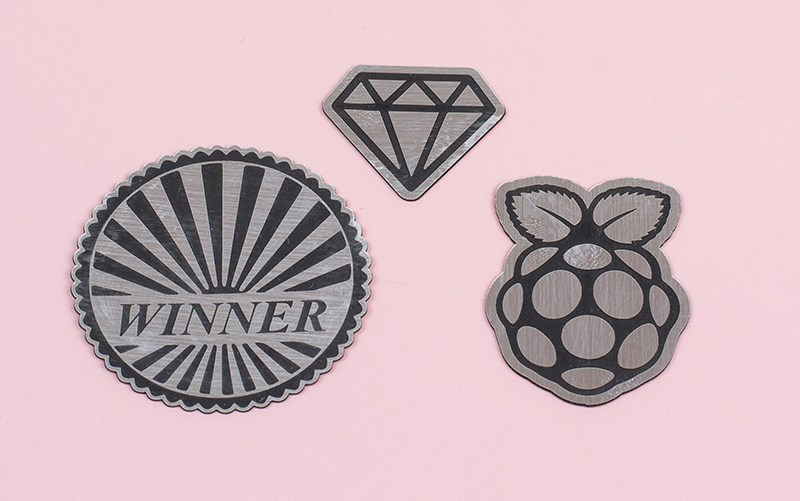 These flexible, self-adhesive stickers are a laser-engraving breakthrough. 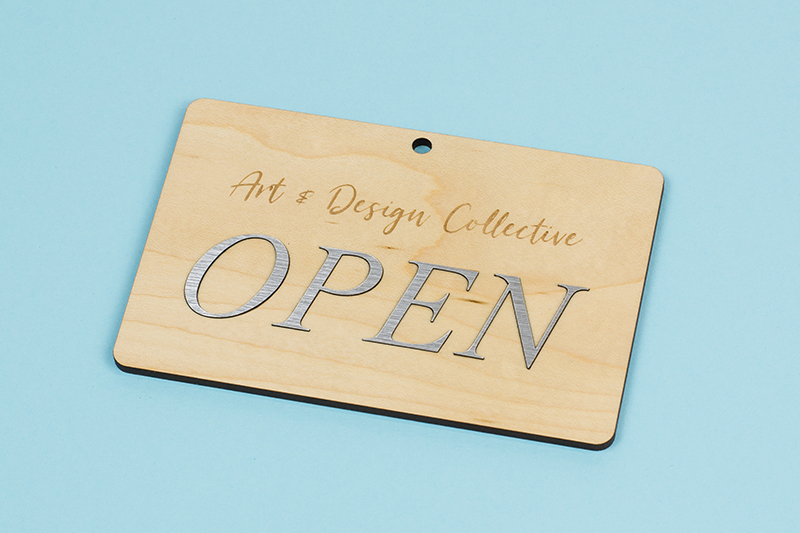 With three brushed metal colors—copper, silver and gold—and contrasting black engraving, adhesive-backed plastic is a great choice for making laser cut designs that pop. 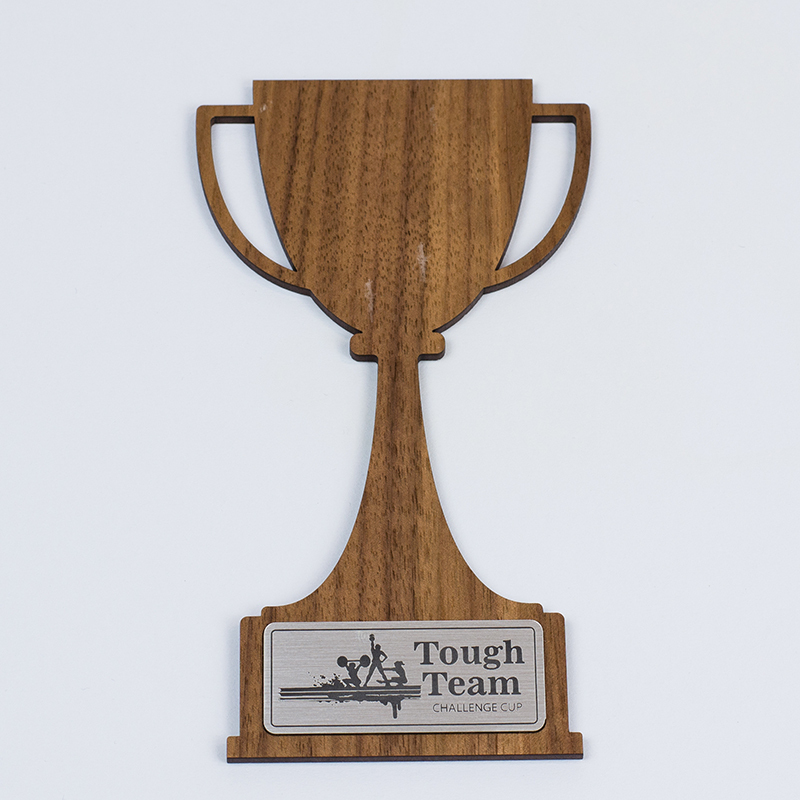 This latest addition to the USA catalog is made from TrophyFlex, a Made-In-USA thin-gauge flexible acrylic composite designed for laser-engraved plates and labels. 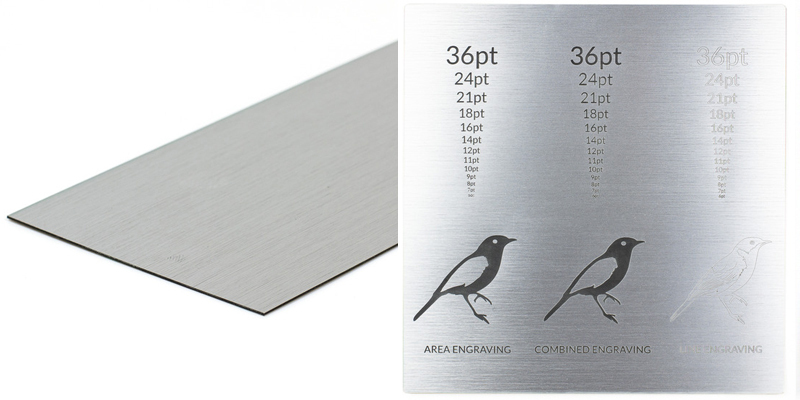 With a durable micro-surface finish in a .015″ thickness, these acrylic stickers use a 3M adhesive to securely stick to a wide range of materials, easily accommodate curved surfaces and quickly take laser engraving into whole new realms. Use it to create anything from nameplates and signage to awards, promotional products and even jewelry that you can either sell or use to build your brand. 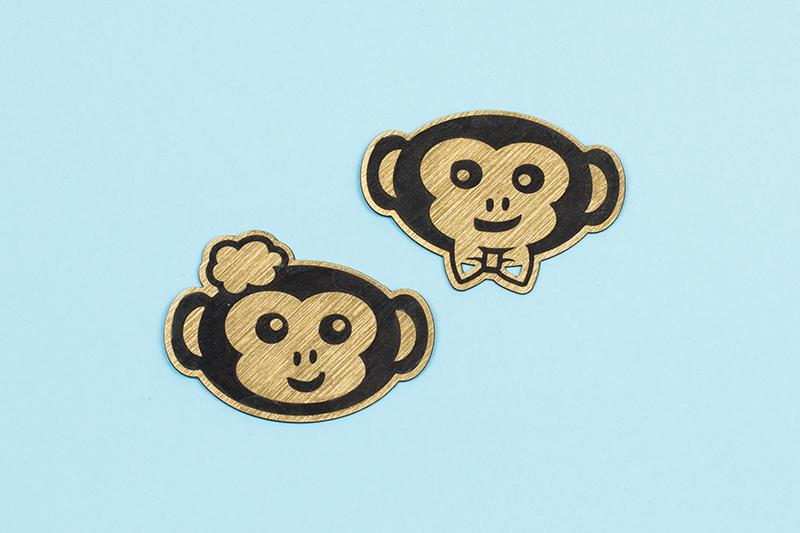 We’re not monkeying around. 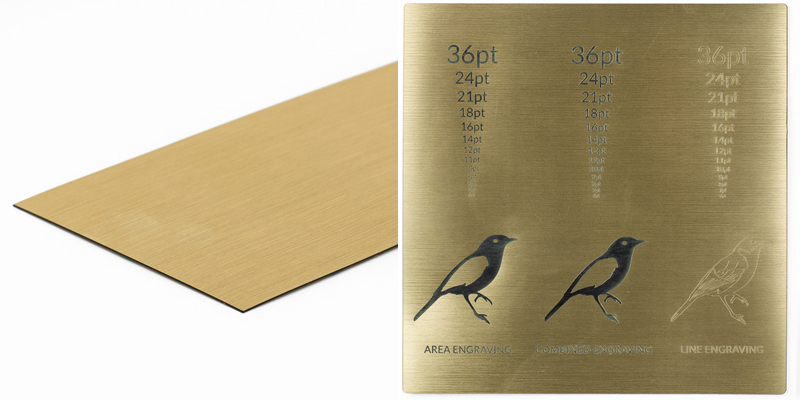 These copper-on-black acrylic stickers not only showcase how laser engraving looks on the material, but it also highlights the precision laser cutting of custom shapes. What’s great about these acrylic stickers is that they not only work on flat facades such as plaques but also on round surfaces such a trophy bases. 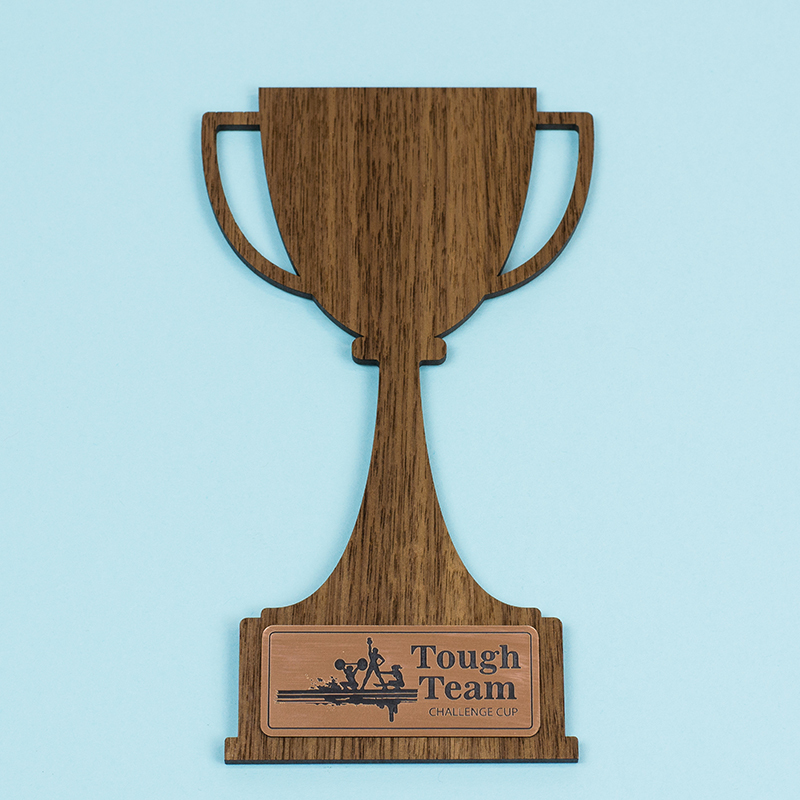 So whether you’re crowning the winner of a 5k or celebrating the achievements of valued employee, give awards that are truly customized and beautifully presented. 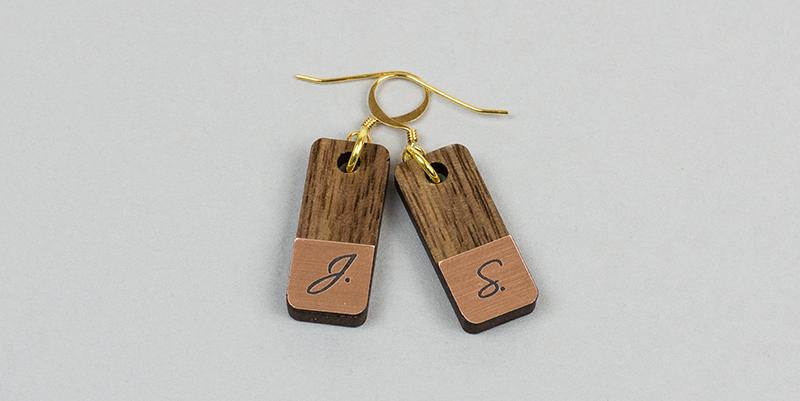 Here’s an interesting jewelry idea: Add custom monogrammed copper-on-black acrylic stickers to premium walnut veneer MDF bases for personalized earrings to sell on Etsy. While the stickers have high durability, you may want to finish off with a resin or lacquer (depending on your base material) to ensure permanence for daily wear. Like jewelry with a modern vibe? 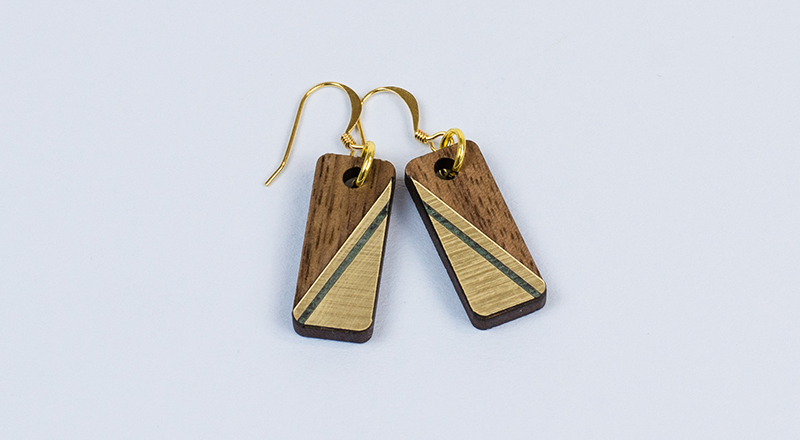 Design these acrylic stickers on the diagonal for a fresh take on wooden earrings. 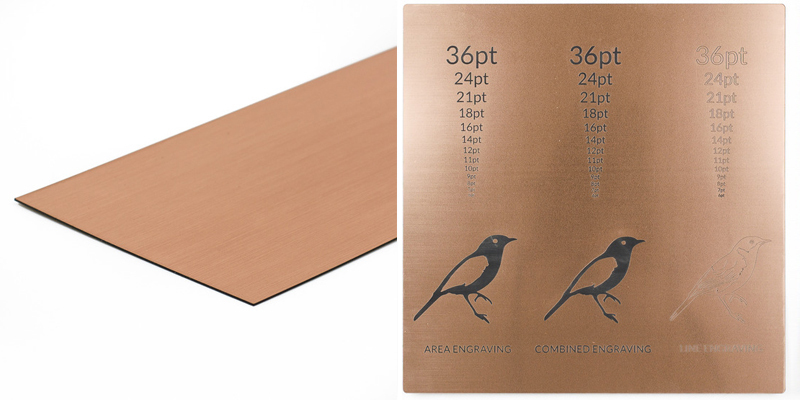 If copper-on-black adhesive-backed plastic catches your eye, get all the details here or collect a sample here to see it for yourself. Rather than exposing expensive 3D products (such as laptops!) 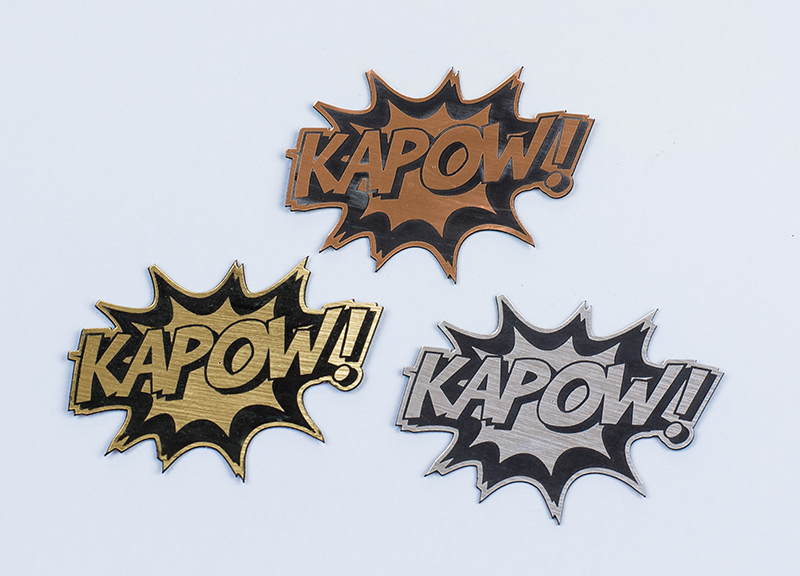 to the firepower of the laser, make these these slick stickers to customize and brand your projects instead. Here’s a second glance at how these acrylic stickers can be used on trophies and awards, this time with some silver flair. 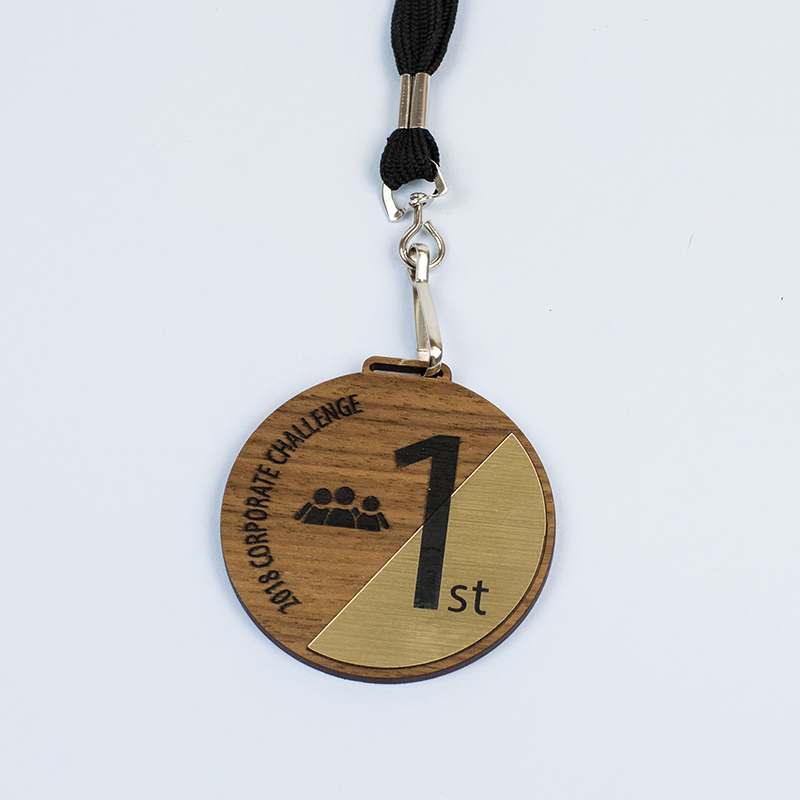 Add a gold-on-black acrylic sticker to go with the silver and copper options, and you can easily recognize 1st, 2nd and 3rd place! Name badges are essential for any event. Because of the number of attendees and logistical needs for being able to print badges on site, most conventions opt for paper badges slipped into plastic sleeves. While practical, it’s not really enough for VIP guests. 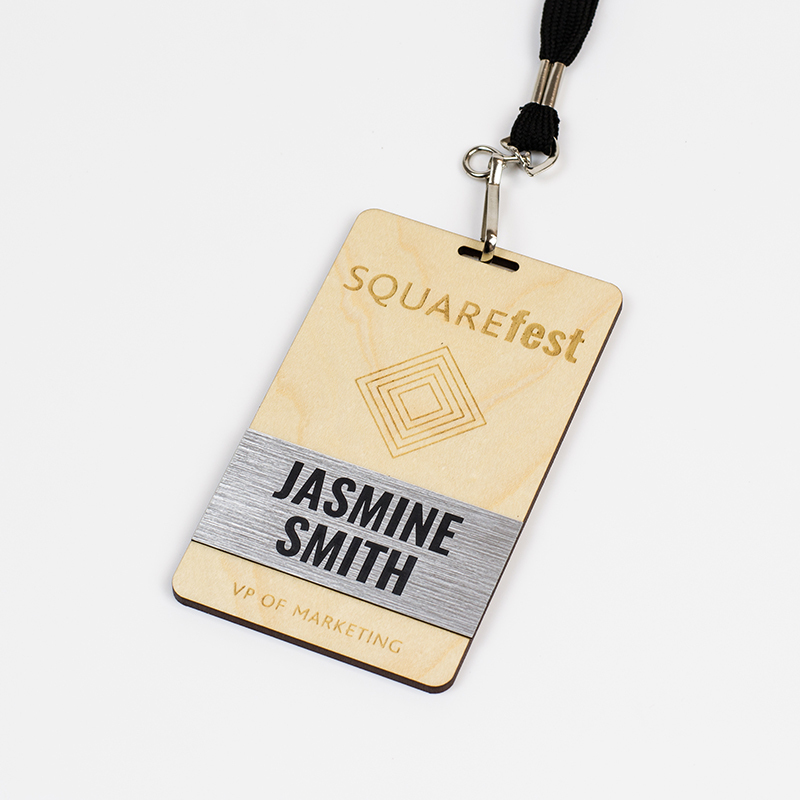 Instead, pair silver-on-black acrylic stickers with birch plywood (or other materials based on your budget and aesthetic preferences) and create an event badge that’s not only functional but also serves as a nice takeaway gift post-show. When you need to create contrast in a big way without blowing the budget, use this adhesive-backed plastic for lettering on a larger piece of material or a window. Rather than laser engraving signage out of a single sheet of material, which can be costly to have the laser travel the entire width/height of the sign, you can use the acrylic stickers and nest the letters closer together for cost savings and then place them correctly on the sign. If you think silver-on-black adhesive-backed plastic is slick, read all about what makes it special here and get a sample here. 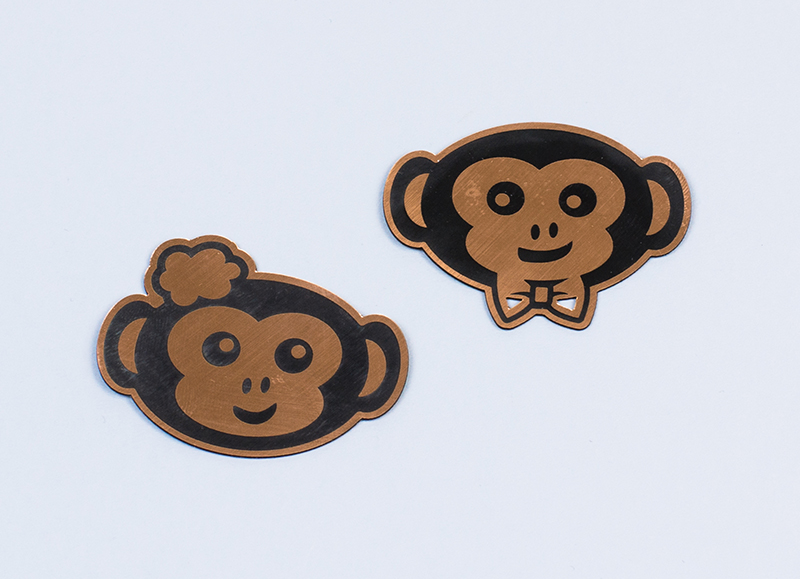 If you thought these primates were perfect in copper, what do you think about them in gold? We’d love to have them hanging around. When designing acrylic stickers, think about the contrasts and implications different colors portray. 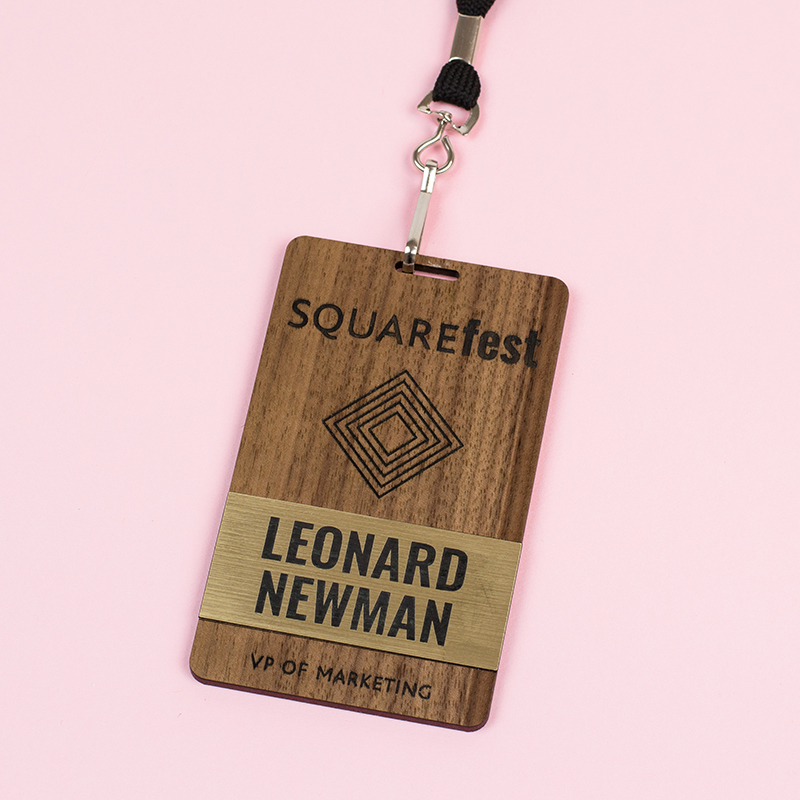 While technically the laser engraving on this event name badge is the same as the birch plywood with the silver-on-black acrylic sticker above, there is a different feel with the gold-on-black acrylic sticker adhered to premium walnut veneer MDF. Get creative when making medals. Adhering this gold-on-black acrylic sticker to a wood base at an angle provides quite the visual interest that can’t be achieved with a single material alone. 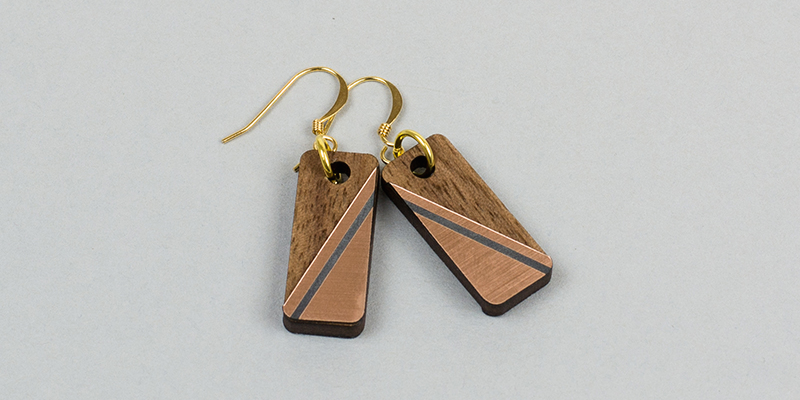 Thought these two-toned earrings looked cool in copper? Check ’em out in gold. 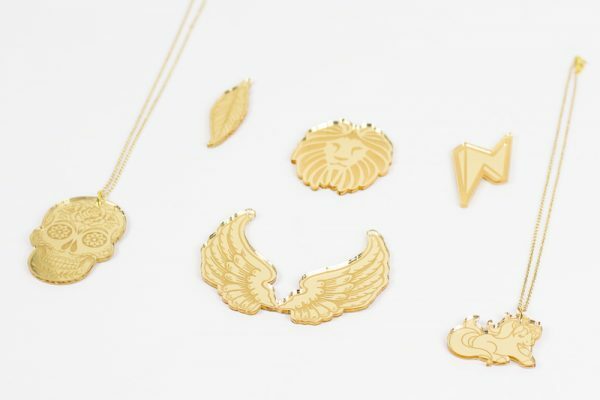 If you created custom pieces out of real gold, it would cost you a pretty penny, but these gold stickers can elevate jewelry designs without requiring a massive price tag. With the added benefit of the second color, you can have some fun by playing around with patterns to create beautifully unique pieces. 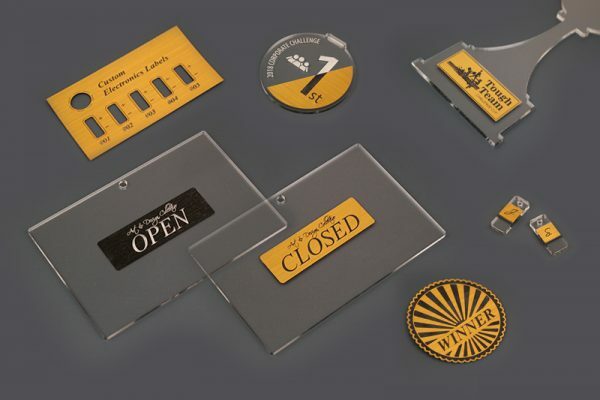 If gold-on-black adhesive-backed plastic sounds like a gold mine of sales, don’t wait to learn more about it here and pick up a sample here. Adhesive-backed plastic is modified with styrene to improve impact-resistance and flexibility. However, this also lowers the melting point of the material and the cut edge is not as cleanly vaporized as with standard acrylic. Caution is advised for very detailed, intricate cutouts as well as for large areas of engraving as the build-up of heat can cause the sheet to deform. 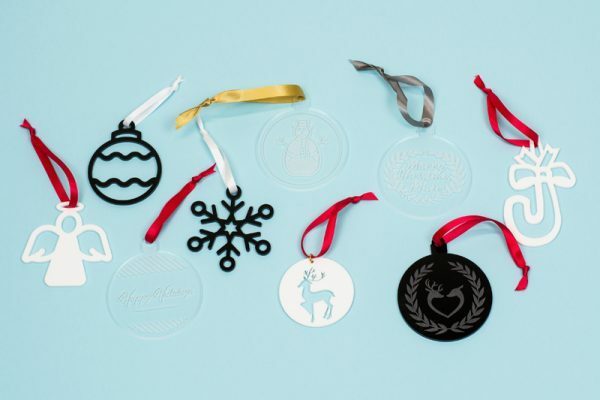 What Will You Laser Cut With Adhesive-Backed Plastic? If you’re like us, you’ll be stuck on this new material in no time. What would you like to make? Show us what ya got! Jump into Adobe Illustrator or Inkscape and turn your inspiration into to tangible ideas. And give us a shout out in the comment box. 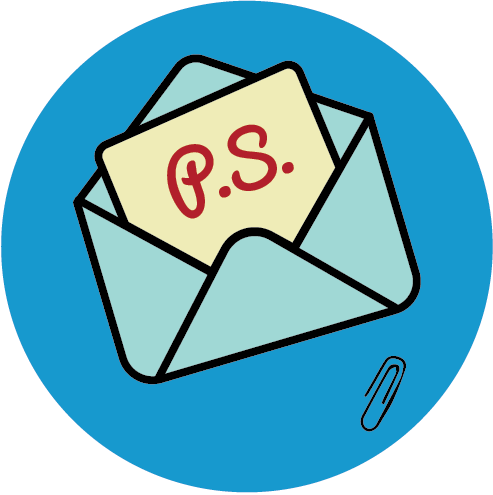 We’d love to hear all about your laser cutter project ideas!